Japanese communications technology satellite. 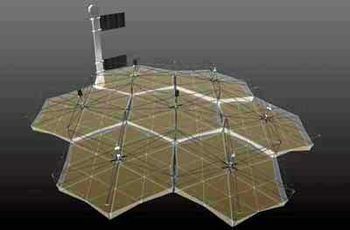 Japan's NASDA space agency sponsored the LDREX experimental antenna. Engineering Test satellite built by NEC Toshiba Space Systems for NASDA, Japan. Launched 2000 - 2006. Status: Operational 2000. First Launch: 2000-12-20. Last Launch: 2006-10-13. Number: 2 . Gross mass: 140 kg (300 lb). Ariane V138's EPS upper stage carried an ASAP5 small payload attachment ring with a special camera system. LDREX was a 6-m diameter antenna which was to have deployed 40 minutes after launch, to test the deployment mechanism for the larger antenna to be used on the ETS-8 satellite. After the test the antenna was to have been jettisoned. However the experiment failed and no deployment or jettison took place. Family: Communications technology sat, Technology. Country: Japan. Launch Vehicles: Ariane 5, Ariane 5G, Ariane 5ECA. Launch Sites: Kourou, Kourou ELA3. Agency: NASDA. Bibliography: 2, 552, 554. 2000 December 20 - . Launch Site: Kourou. Launch Complex: Kourou ELA3. LV Family: Ariane 5. Launch Vehicle: Ariane 5G. LDREX - . Mass: 1,414 kg (3,117 lb). Nation: Japan. Agency: NASDA. Class: Technology. Type: Navigation technology satellite. Spacecraft: LDREX. Decay Date: 2010-03-21 . USAF Sat Cat: 26640 . COSPAR: 2000-081C. Apogee: 30,257 km (18,800 mi). Perigee: 241 km (149 mi). Inclination: 2.40 deg. Period: 527.50 min. Ariane V138's EPS upper stage carried an ASAP5 small payload attachment ring with a special camera system and the LDREX experimental antenna for Japan's NASDA space agency. 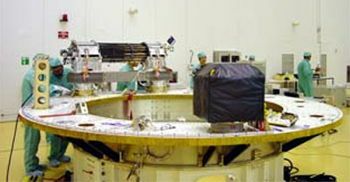 LDREX (Large-scale Deployable Reflector EXperiment) was a 6-m diameter antenna which was to have deployed 40 minutes after launch, to test the deployment mechanism for the larger antenna to be used on the ETS-8 satellite. After the test the antenna was to have been jettisoned. However the experiment failed and no deployment or jettison took place. 2006 October 13 - . 20:56 GMT - . Launch Site: Kourou. Launch Complex: Kourou ELA3. LV Family: Ariane 5. Launch Vehicle: Ariane 5ECA. LDREX 2 - . Nation: Japan. Agency: JAXA. Class: Technology. Type: Navigation technology satellite. Spacecraft: LDREX. Decay Date: 2010-09-30 . USAF Sat Cat: 29496 . COSPAR: 2006-043C. Apogee: 26,980 km (16,760 mi). Perigee: 227 km (141 mi). Inclination: 7.20 deg. Period: 468.50 min. LDREX-2 was attached to the upper stage. It deployed a 6.5-meter antenna design planned for the later ETS-8 satellite.